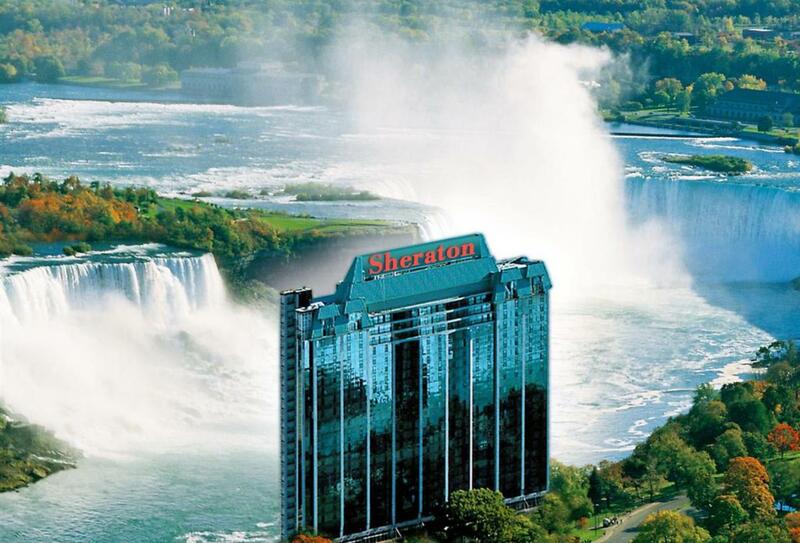 Sheraton on the Falls is a 669-room resort on Falls Avenue, a prestigious location, high above Niagara Falls. 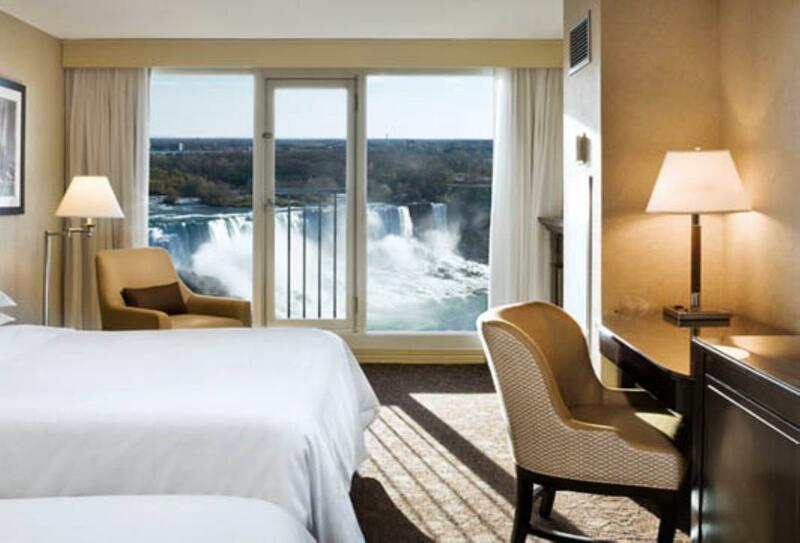 The hotel has spectacular views of the falls from both public areas such as the Fallsview Restaurant and from over half of the rooms through floor to ceiling windows. There are two on-site restaurants, a Starbucks coffee shop and Christienne Spa – the only spa with a view of Niagara Falls. In addition to all of this, the connected Falls Avenue Resort offers more restaurants, shops, a casino and an indoor water park. 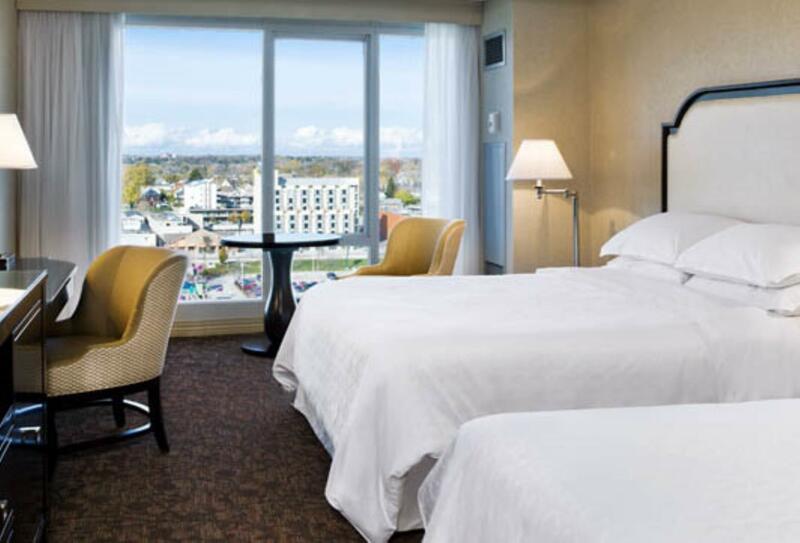 Located higher up, between 14th and 19th floor, these rooms offer the most spectacular views of the majestic American and Canadian Falls through floor to ceiling windows. Two lounge chairs, a love seat and a coffee table add to the comfort. Floor to ceiling windows reveal views of the American and Canadian Falls. There’s also a fireplace and contemporary furnishings including a love seat, two lounge chairs and a coffee table. 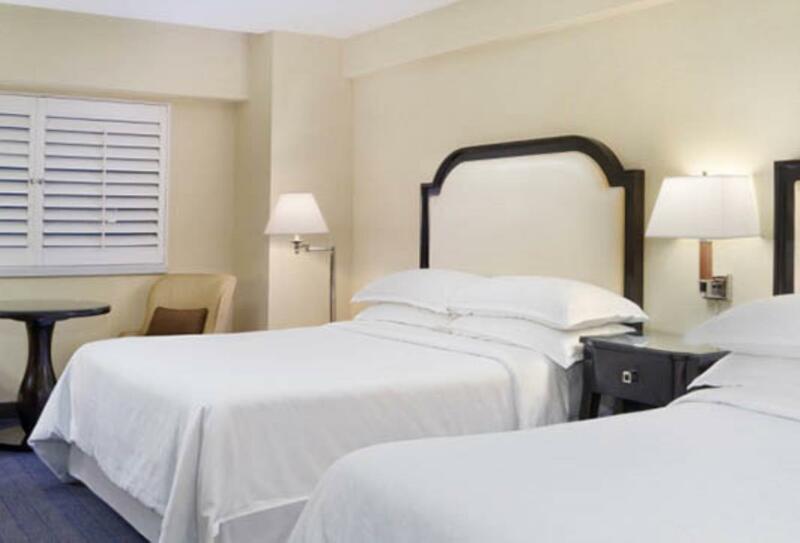 These rooms are on floors 8-12 and include a marble and granite or tile and marble bathroom. Functional room next to the conference centre on the 3rd to 12 floors of the hotel. • Connected to Falls Avenue Resort with casino, restaurants, indoor waterpark etc. Showcases the region’s rich agriculture through a continually evolving seasonally based menu enhanced by an extensive wine list. Open daily for dinner 18.00-22.00. 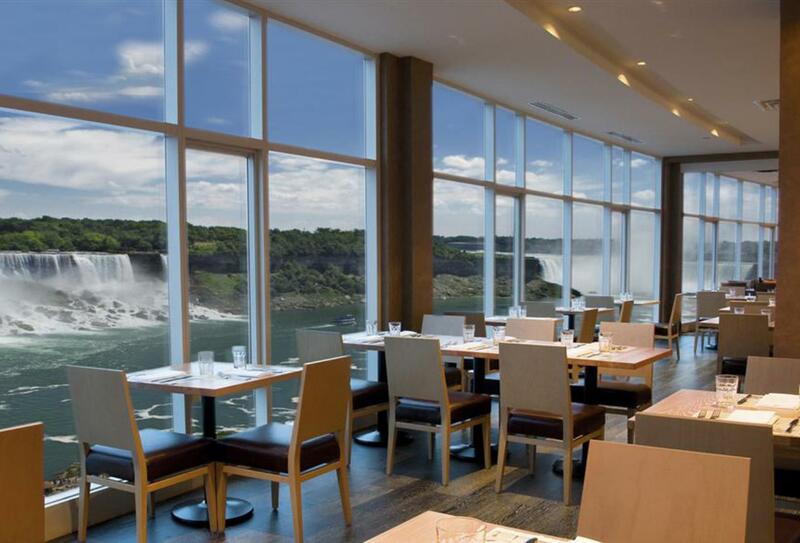 Buffet restaurant with 280 seats of amazing Niagara Falls views and live cooking stations. Surrounding floor to ceiling windows showcase fantastic views of Niagara Falls while celebrity chef Massimo Capra blends prime local ingredients to create signature dishes paired with carefully selected wines. Open for breakfast 07.00-10.30, lunch 11.30-14.00 and dinner 17.00-21.00 (until 22.00 on Friday and Saturday). 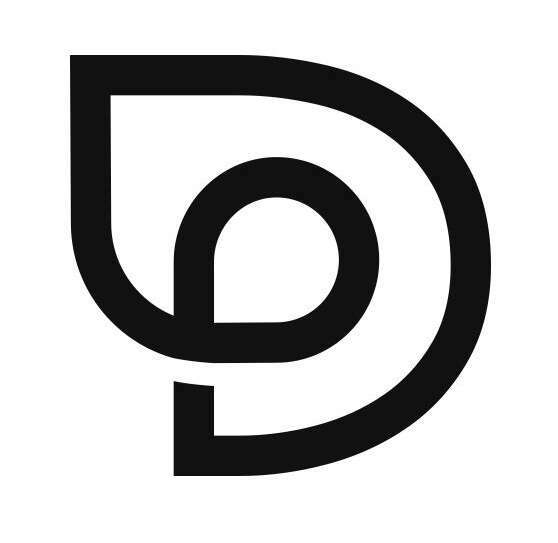 Innovative craft beers from locally sourced ingredients by an award-winning brewery. Family restaurant open 365 days a year (hours vary) with sandwiches, salads, pasta and desserts. Includes the mushroom bar where you can have an appetiser and a drink on an animal inspired bar stool. This Falls Avenue restaurant beside Sheraton on the Falls hotel is Niagara’s own tribute to Rock and Roll history. It serves steaks, burgers and salads and offers a selection of drinks at its 80-foot guitar bar flanked by rock videos. Open 11.00-02.00. Serves all day breakfast of omelettes, pancakes, waffles and more. Offers additional menu items for lunch and dinner. Desserts and a special menu for children are also available. The famous coffee shop is in the lobby of Sheraton on the Falls hotel serving its full menu of coffees, pastries and cold drinks. Offers high quality soft serve ice cream. Sheraton on the Falls is on Falls Avenue in the heart of the Niagara Falls tourist district, on the edge of the falls.